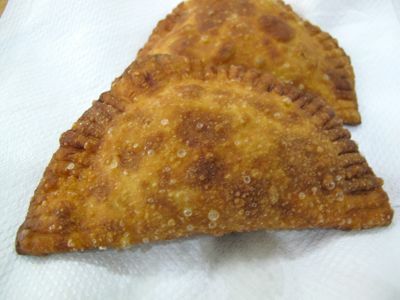 A few extra uncooked empanadas were thrown into the freezer to see how they would hold up to baking or frying the next day. We let the frozen half disks thaw for 15 minutes before frying them in hot oil. The condensation on the dough resulted in Zubuchon like blistered skin. Not terribly attractive but we are working on cosmetics! this looks very tasty, i would love to dip them in spiced vinegar or a lechon sauce. yum!!! 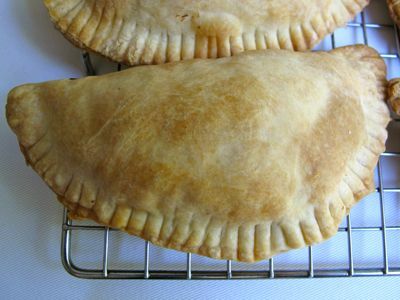 Would you use a different dough formula for the fried empanada than the baked empanada? The Latin Americans seem to use a different dough formula for their fried and baked empanadas. OMG! as in OMG talaga…i drool as i remember the zubuchon lechon sisig; it was perfect! but you’ve just told us perfection has its levels? OMG! Yum! I want to eat those right now! MM, how do you make the dough? Baking is surely a healthier way of preparing empanadas. I lllooovvve empanadas FRIED! To hell with cholesterol, LIVE LIFE! “healthier”? hehe…MM, you’ve got lechon sisig inside! Fried or baked, i want it, definitely delicious! betty q, your suggestion is a must try. 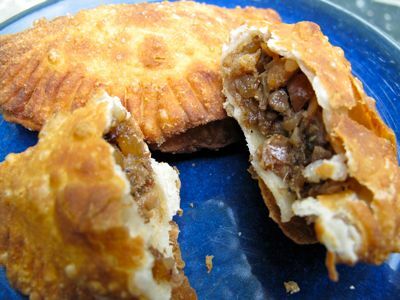 Kitchen, your mention of vinegar is now making me crave for Ilocos empanada!! MM, we have baked our empanadas for years now. We don’t brush it with oil. Just prick the top with fork tines then when halfway done, we brush it with a beaten egg mixed with milk to give it a more golden color. Our recipe comes out crisp and definitely non-greasy. I sooo much prefer to to the fried ones. Hi MM, have you considered using a tortilla press instead of rolling the dough? 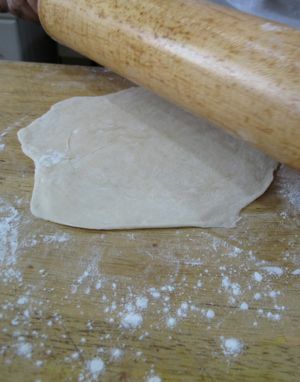 My recipe uses a butter based dough and we cut off pieces and throw it into the press. So easy! In the states you can find them in Chinatown or Hispanic grocery stores. Your empanadas look delicious! 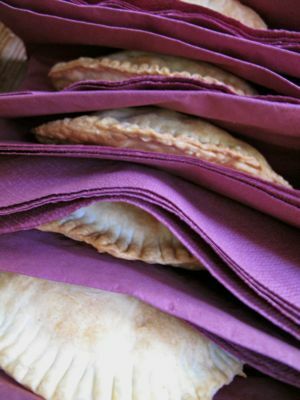 zena, we make our empanadas the same way, brushed with eggwash then baked. when my kids were in grade school and were tired of rice and ulam or sandwiches for lunch, i made them big empanadas with different fillings. the empanadas saved me for the rest of the year! Millet, Zena: next time you make leche flan,save the eggwhites and freeze. Then use the whites instead of eggwash to brush on empanadas before baking. Just beat the whites lightly with a fork first and then brush away. It gives the surface a nice sheen without being too yellow-y. This is what I use to brush on the surface of my apple pies. 1521 Restaurant at Shaw Boulevard has sisig empanadas. Goodness I feel hungry now. 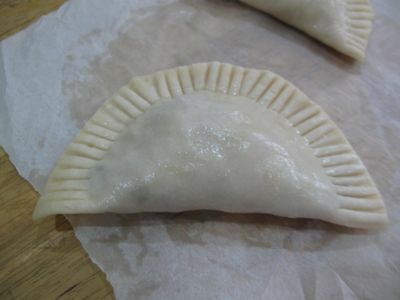 Question po MM: what’s the ideal temperature when baking empanada’s rather than frying? depende po ba yan sa size ng empanada? OMG. what an inspired idea! i loovee ilocos empanadas and these seem to be match made in piggy heaven as well. Hi, MM! How about trying puff pastry for the crust? Empanadas were my comfort food when I was in South America, beef , tuna, chicken and they deliver, kinda like inthe Philippines. My daughgter laughs when I tell her that McDonald’s deliver, or KFC hhehehehe. It is unbelievable for kids here in the states. Crossing the border between Brazil and any of its neighbors (this means the rest of South America except Chile and Ecuador) can be linguistically disorienting. A swath of innocent words in Spanish all of a sudden take on ribald connotation when used in Portuguese. Lots of common words switch meanings. The common PorteÃ±o and Montevideano food empanada becomes pastel as you cross into Brazil and vice versa. Since the Brazilian pastel is always fried, they distinguish the baked ones with the modifier â€œasadoâ€ and if this last one happened to be baked in a wood-fired oven such as in most rural areas of Brazil, the experience can be quite revelatory and transporting. They are usually served in pizza parlours so I suspect they all use the same dough as for pizza. Anyway, as an ex-owner of an empanada shop, I canâ€™t detect a noticeable difference between their crust for fried and for baked empanada. Oh, and they invariably use lard, come hell or high water, as the shortening of choice. In Buenos Aires beggars ask you for change for an empanada, a common, ordinary, weekday food whereas our empanada is an occasional special treat. Thatâ€™s probably why whether fried or baked, our crust is usually discretely layered, tender and flyingly flaky if not intimidatingly labour intensive. great tip, bettyq! many thanks! will try that next time i bake pies and empanada. Hi Sam…glad you enjoyed the suman. I have been meaning to make some for my kapitbahays as well to eat with mangoes (it is mango season here as well!). Here is afaster way to do it. If you can find a piping bag there…disposable or the regular one..use that to pipe the filling. You can make an assembly line and can finish a few hundred in no time at all. If you cannot find the piping bag, use a ziplock bag and cut the tip to your desired size of your suman. Happy Piping! and while you are a it, make about 500 and freeze them after steaming…saves you a lot of time when your friends have a craving…just re-heat them again by steaming after defrosting. Mr.MM, Im a big fan, please post recipe of empanada! Naglalaway na ako here. More power to you!!! My husband would love if I made those. He loves lechon sisig but coming from the states, I have no idea what is real sisig. I have seen many versions. May I please have a contact number of which I may be able to use when I call or contact when needed.